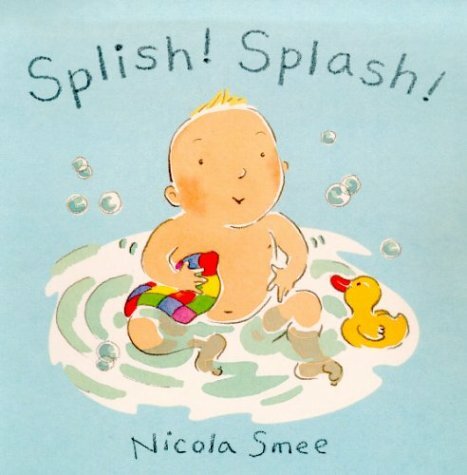 Nicola Smee Baby Action Rhymes:Splish! Splash! A fun, rhyming text that you and your baby can enjoy together. With a retrain that includes simple actions for your baby to follow. this is a book that will encourage lots of giggles and splashing at bathtime. Splish, Splash. tickle, giggle. Hands go clap, toes go wiggle! Count with your baby on their fingers and toes and make this an enjoyable interactive reading experience. A sturdy board book that has a soft, furry towel for your baby to feel on the last page! Nicola Smee is a popular illustrator worldwide whose warm and enchanting style saw her short-listed for The Sainsbury’s Baby Books Award in 2001. She has created illustrations for children’s TV programmes as well as having many of her own books animated. In addition she has contributed to various magazines and designed book jackets and greetings cards. Nicola lives in Essex. 1. Baby Action Rhymes:Splish! Splash!